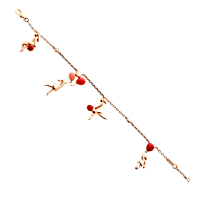 The romance diamond gold bracelet, by Van Cleef & Arpels, is one of their more whimsical and unique designs. 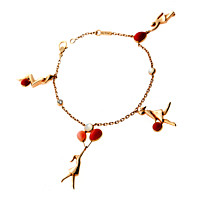 18kt rose gold figurines are playfully displayed on the bracelet, along with deep coral and milky moonstone gems. The link chain is also adorned with a bezel set, round brilliant diamond.